I lose multitools like my drink at a party. And, it’s true, but my friends at Park Tools have my back and sent me a package FULL OF THEM. You know, I can’t really tell you which is better or even rank them, I just have them now in a bowl near the door, and grab one that either fits in my fanny pack, a pocket, or my backpack for when I’m traveling. I’ve actually used mine more on suitcases than my bikes recently, but always have one now; even if I misplace them all the time. 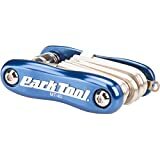 The best part about Park Tools is their quality, of course, but also availably. You can get them at a shop or from Amazon and for reasonable prices. I’ve linked to a few of them. Pro Bike Tool Bike Multitool 8 in 1 Reliable, Compact and Lightweight Repair Kit for Road and Mountain Bikes. Strong Full Stainless Steel, No Rust, Long Leverage Bicycle Tools, Includes Bag. 3mm, 4mm, 5mm, 6mm, and 8mm hex wrenches; 8mm, 9mm, and 10mm socket wrenches; and a straight blade screwdriver. Each of the nine tools is carefully positioned so the MT-1 can be effectively used on those “tough to get to” nuts, bolts, and screws. Nominally 110mm long, 35mm wide, and 8mm thick. And, after years of riding in the rain with it, I know it’s impervious to water. Shared above, the one tool stuffed in my bag for road trips and mountain biking is the much larger and more capable Premium Multi Tool. Here’s a video about their quality multi-tools. Sure they make a great gift; especially for the absent-minded cyclists like me. I have the happy hour kit for beers and want the Corkscrew Bottle Opener too.